Wrapping up a successful internship with the Bibb County Department of Family and Children Services, MGA soon-to-be graduate George Davis prepares for a career protecting children and helping them thrive. Full Name: George Dontanec Davis. High School: Central High School, where he participated in chorus and FBLA. Family: Modestine Risper (Mother) and Alton Davis (Father). Employment: "I worked at the Booker T. Washington Community Center/Stone Academy Inc. for about 10 years or so before they closed down. Currently I work at Lifeway Christian Bookstore and am interning at Bibb County DFACS." Activities: Student African American Brotherhood (SAAB) student organization. Career Goals: "I have two dream jobs: I would like to run my own non-profit organization working with inner city children because I feel they have so much potential and it will never be let out until someone helps these children bring it out. I would also like to be an inspector for Bright from the Start. Bright from the Start enforces the rules and regulations for childcare facilities and I would love to be an inspector for them to make sure that all childcare facilities are operating the way that they should be within the guidelines of Bright from the Start." 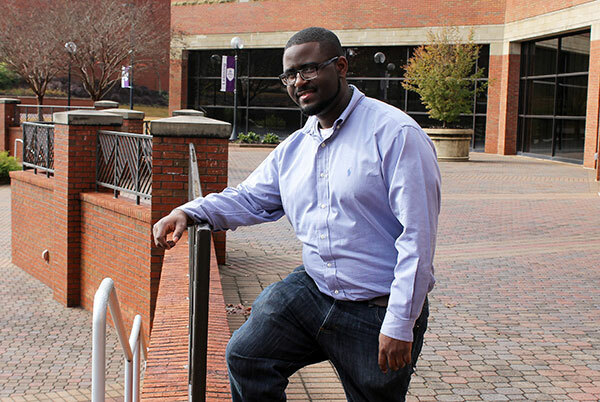 He chose Middle Georgia State University because … "It was local and I did not want to leave Macon when I graduated from high school. I also knew that it was a challenging school. I like a challenge so I went for it. My mother graduated from MGA's nursing program and she always told me that if you can make it at (what is now Middle Georgia State), then you can make it anywhere." The greatest thing he discovered about Middle Georgia State was … "There are two things. The first changed my life and my goals. I learned that MGA had a Public Service major. Before I was a Biology major but I really did not know what I wanted to do with my life. I thought I wanted to be a dentist because I knew that they made good money but that was not really where my heart was. I wanted to help people but I had not heard of a Public Service degree before. I started researching it and I knew that was the major for me. So I guess the first and greatest thing that I discovered was myself and what I wanted to do with my life. "The second thing that I discovered was that this school is very hard and challenging. But I rose to the challenge and now I am confident that I can do anything I want to do." His greatest academic experience so far has been … "Dr. Michele Scordato's class. She was probably the hardest and most strict professor that I have had at MGA but she pulled the best out of me." To him, greatness means … "To strive and achieve your top goals, not for anyone else but for yourself. Greatness is an ongoing process. With every accomplishment, find something even better and go for it. Finally, greatness is setting yourself apart. It is easy to try to fit in and do what has already been done but the challenge of greatness is to do something nobody else is doing." One thing people don’t know about him is … "I would like to eventually adopt one or two children. There are so many children in the system waiting to be adopted into loving families." In five years ... "I see myself working for DFACS for two or three years and obtaining my master's degree in Public Administration, then beginning my career with Bright from the Start. Eventually I hope to start a non-profit organization to help children."